Hello everyone! It's Polish Days time again! I'm writing this super early because I will be really busy the day this post goes up. 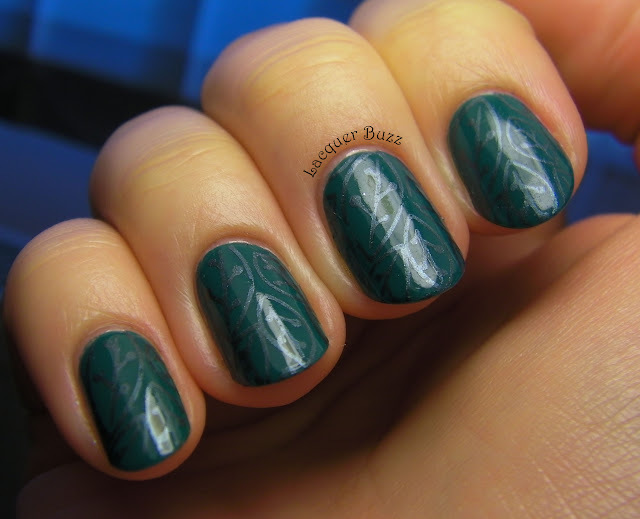 For this month's event, we had to do a manicure inspired by nature. I must admit that I was really out of ideas and my brain wouldn't function at all, so I went with something really simple and not very creative. This type of manis are some of my favorite ones to do and I never get tired of them. I'm talking about subtle stamping. But first, here's my base color. I really hope I got the number right because I've looked for this polish all over the internet and couldn't find any info about it. This is my first Miss Sporty polish and it comes from the Lasting Colour line. It doesn't have a name anywhere on the bottle and the number I found, which looks like 520, is kinda hard to read. It's a very nice teal green creme that I bought on a whim in a local store. I was quite impressed by the formula of this polish. It was creamy and awesome and went on like a dream. Pigmentation was good too. I did 2 coats for these swatches and I loved the fact that it dried really fast. The only thing I didn't like was the wide brush which seems to take over all the European drugstore brands by now. I just don't like working with them. This one was a little uneven too and made application a bit tricky in spite of the great formula. 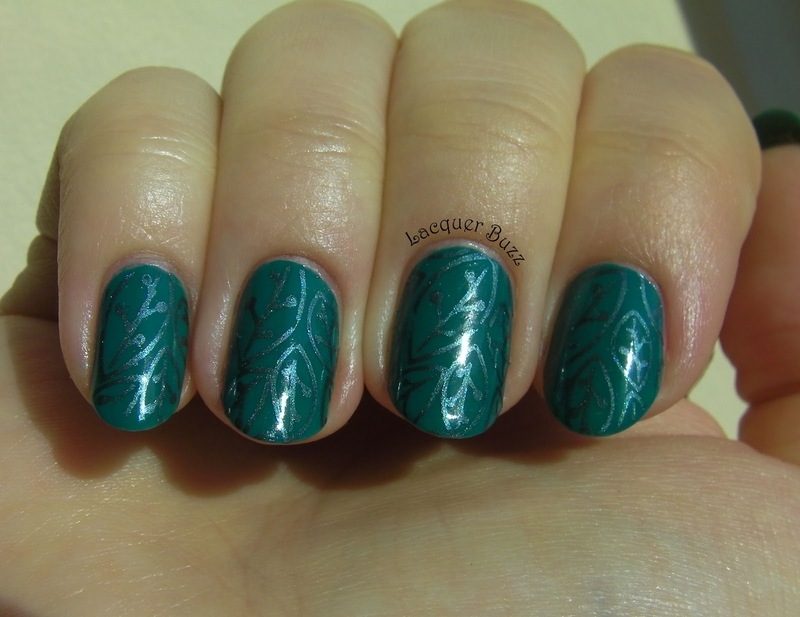 I stamped some leaves on top using plate CH33 from the new Cheeky set and Color Club Masquerading. Here's how it looked in the sun. The Color Club is a teal metallic polish that stamps perfectly. Of course the fact that this was a tone on tone stamping made it very hard to photograph. It looked really cool in reality because the stamping gave a textured effect to the whole nail. This actually reminded me of a jungle, so I hope it counts for today's theme. I hope you liked my manicure and please don't forget to click on the links below and check out what the other participants have prepared this month. LOve the combination, the stamps looks really great! Love the subtle stamping!! Great combo! I love the metallic stamping. It is lovely. Very pretty. I love the stamping!!!! Really liking how lovely and subtle this mani is. Great job with the stamp work! I love that pattern, it looks great! And the subtle stamping is amazing, I think you picked the perfect stamping polish actually! Such a pretty color and design! Yep, rain forest is great too! Thank you! Thank you Marisa! I love subtle stamping so much! Thank you! I just love subtle stamping! Thank you! Yeah, the image with the leaves is so cool. And it goes so well with this combo! oh this is such a neat and calming mani!!! I can't believe I missed this month's Polish Days!!! gah!! Thank you! Yeah, you really have to pull yourself together lol. We missed your post!